Grayson signed a reserve/future contract with the Broncos on Monday, according to the NFL's official transaction report. Analysis: Grayson spent the majority of the season on the Broncos' practice squad and will remain with the team throughout the offseason, giving him a chance to compete for a spot on the 53-man roster next season. The Colorado State product will turn 28 this offseason. Grayson agreed to join the Broncos' practice squad Thursday, Troy Renck of Denver 7 News reports. Analysis: The 27-year-old was originally cut by the Falcons to begin 2018 after struggling throughout the preseason slate. The Broncos had space for a quarterback after the team cut Chad Kelly on Wednesday. Grayson has never seen regular-season NFL action in his career. Grayson missed the cut for Atlanta's 53-man roster on Saturday, Will McFadden of the team's official site reports. Analysis: The fourth-year man out of Colorado State struggled mightily throughout the preseason slate, completing 36.8 percent of his passes and finishing with a dismal 3.5 yards per attempt average. Grayson's best chance to make an impression came against the Jets in Week 1, when he completed three-of-10 attempts for 38 yards (just nine attempts in other two other exhibition appearances). The 2015 third-round pick will try to catch on with the practice squad or pursue a backup role elsewhere. Grayson signed a reserve/future contract with the Falcons on Monday, Will McFadden of the Falcons' official site reports. Analysis: Grayson has only suited up in one NFL game during his three-year career, but he has never played an offensive snap. 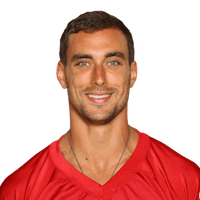 He'll likely need a stellar training camp to prove he's worthy of being Matt Ryan's backup, since current backup Matt Schaub is an established veteran and has one year remaining on his contract. Grayson was signed to the Falcons' practice squad Tuesday. Analysis: Grayson was recently cut from the Falcons' practice squad in order to make room for kicker Mike Meyer, who was brought in with Matt Bryant dealing with injury. With Bryant healthy, Meyer became expendable, and Atlanta used its open spot to re-sign Grayson. The Falcons released Grayson from their practice squad Wednesday. Analysis: Grayson's dismissal clears a spot for kicker Mike Meyer, who could be added to the 53-man roster ahead of Sunday's game against the Cowboys if kicker Matt Bryant (leg) is unavailable for that contest. Since exhausting his college eligibility in 2014, Grayson has made one appearance in an NFL game, which came back in 2015 as a member of the Saints. There are no videos available for Garrett Grayson. Click here to view all videos.